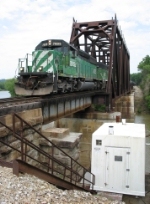 Description: A local crosses the Mullberry Fork bridge. Description: The local rounds a curve at Dora. Description: BNSF northbound local crosses the Mulberry Fork of the Black Warrior River. Description: Westbound BNSF stack train passes the NS transfer to the IC at KC Jct. Description: Westbound stack train rolls through KC Junction. Description: Ex C&S SD40-2 #7805 leads the X-TACKCM past my house. Description: SD40-2s as far as the eye can see - a long string of BNSF SD40-2 locomotives sits behind a warehouse in Fontana, California, awaiting a sale to a railroad that needs them. There are at least 26 units in this line, and another shorter string on an adjacent track.